Disclosure: No conflict of interest. The application mentioned is free and I am not a spokesperson for the company nor have I ever been in contact with the operators of the company. I receive no benefits from the application other that what anyone else would receive using the application. I am an alumnus of UBC and have a Clinical Faculty position and do have a Campus Wide Login account with UBC including Library privileges. I graduated from UBC Medical School in 1986 and have seen the birth of rapid access medical literature. I still remember Index Medicus and the “latest” paper on a topic being from 2 years prior. Much of my medical knowledge was gleaned from textbooks, which would have a lag time of 2 or more years from the time of research being published to being included in the textbook. I subscribed to a number of journals, but ground breaking paediatric research would often be published in a journal like the Lancet, NEJM or BMJ so here was another 3 journals I had to keep an eye on. I felt continually behind the times and stressed that I would not be giving the most up to date care. When I was working 80 hours per week, journals would arrive, I would quickly scan but would not get into articles in depth. It already felt hard enough to protect my home life without having to spend hours reading each week. When I moved to the NICU, I had a steep learning curve and needed to know more about treatment modalities like ventilation, inotropes and their long term effects. I was surrounded by Residents and Fellows who were perusing the journals electronically and seemed to have the latest information at their fingertips. Sometimes I would feel inadequate to contribute to clinical discussions as I had not read the “key” paper on BPD and was too proud to admit this in a crowd. It was the conversation between myself and a fellow Clinical Associate, Dr. Zaneta Lim, that gave me an opportunity to do things differently. We were talking about trying to keep up with the literature, and she mentioned an application that she used, called “Read” by QxMD. 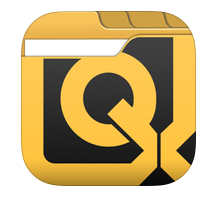 “Read” by QxMD is a free application that provides a conduit for literature to be delivered electronically to you. The application provides a link between you and a proxy server (in my case, UBC and the Campus Wide Log-In for Library Services). I signed up with QxMD and it linked to the UBC Library through my account (having provided the necessary information). The application then asked me what journals I would like to follow. I selected 5 journals of Neonatology and Perinatology. The connection was made, and the application provides abstracts for all of the articles in each of these journals every month. Within the abstract, you can tap at the bottom, and the full article will be downloaded to you for further perusal. You can also make a comment on a paper, save it, share it on Facebook or send it to someone. Rather than denuding a forest receiving journals, I have an application that I open at least 3 times a week and scan for new articles. The number of articles feels manageable because of the size of my iPad and the speed at which one can read an article abstract. I look at articles in full when they are pertinent to my work and if I have questions about methodology or other related studies. I can lay in bed and read, or read through supper at work. Like all kinds of medical reading, I need to discipline myself to keep up with the literature, but this application makes the delivery much easier for me. I imagine medical knowledge as a web, and as I make more connections with the literature, I make more connections on rounds and in clinical scenarios. The amount of learning feels logarithmic versus linear. In my opinion, Read by QxMD does not replace the need to look up a topic in a textbook or look for a good review article on a rare subject. There will always be the need for a literature search or search for an approach to something. Read by QxMD provides the current research and opinions on topics in your field in a user-friendly manner so that I am not the last person in the province using Ribavarin for RSV infection when everyone else has read about the lack of efficacy. All physicians in British Columbia will soon have access to the College of Physicians and Surgeons of BC library’s e-journals collection through the Read app. The College library is in the final stages of working with QxMD and we expect, by early September, College registrants will be able to set the app’s “Institutional Access” to the College and have access to over 2500 propriety e-journals including high impact titles such as Lancet, BMJ, Mayo Proceedings, American Journal of Psychiatry, and various Clinics of North America. Thanks for the kind words about the Read by QxMD service! As it turns out, ‘Read’ was in development in Vancouver so very fitting that it should written up in UBC CPD’s “This Changed My Practice”. As a fellow graduate from 1986 I relate to the feeling of inadequacy compared to the medical students, residents and young graduates when it comes to keeping up to date. I am pleased to see the College library will be making access to the Read app available to us. I look forward to accessing it and hope it will help keep me current. 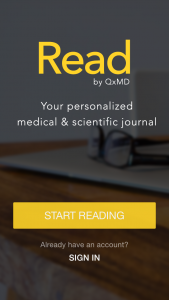 Thanks CPSBC I now use Read by QxMD every day: easy, increases my awareness of the latest topical articles, easy to search, and easy access to a downloadable pdf of the article.